Two Book Friday time!!!! 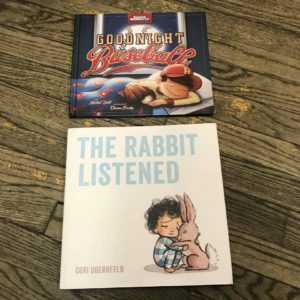 First up this week we have Goodnight Baseball, a perfect book for this time of year especially because Jazz will be attending her second MLB game in May. Also this week we have the fantastic book The Rabbit Listened, this book centers around the main character Taylor who is drawn to look like either a boy or a girl and who is sad that the tower of toys they built has fallen. Although other animals offer advice only the rabbit listens which is all the child really wants, someone to listen to them.